Chinese Premier Li Keqiang offers Elon Musk a green cardsteemCreated with Sketch. Elon Musk has reportedly been offered a green card by China so that he can come and enjoy hot pot anytime. 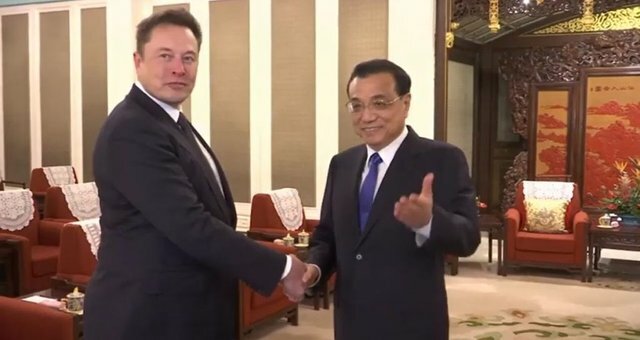 The Tesla CEO was presented with this offer by no less than Chinese Premier Li Keqiang during a meeting between the two on Wednesday regarding the future Tesla gigafactory in Shanghai which broke ground on Monday. “I hope to build Tesla’s Shanghai factory into a global example. I really love China, I’m willing to visit here more often,” Musk told Li, according to a readout from the meeting. Once an extremely lofty goal to aspire to, Chinese permanent resident permits have now become easier to obtain. Over a period of just two months last year, 1,881 foreigners received their green cards. That’s about equal to the number given out in all of 2017. Previously, only hundreds would receive the honor each year. If he really does receive his Chinese green card, Musk will join the likes of Nobel Prize-winning chemist Kurt Wuethrich, Nobel Prize-winning chemist Feringa Bernard Lucas, and, of course, basketball star Stephon Marbury. Tesla’s $5 billion gigafactory has been called the largest foreign investment in Shanghai’s history. When it is fully operational, it aims to produce 500,000 vehicles a year, capitalizing upon the world’s largest market for electric cars.